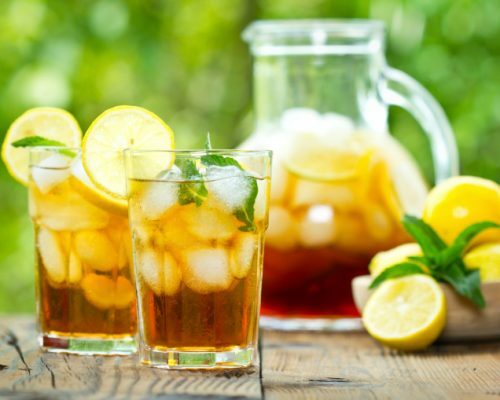 Home » Healthy Eating » Iced tea: Is it good for your health? Iced tea: Is it good for your health? You’ve probably seen those commercials for iced tea. As people in the commercial take a sip, they feel instant relief and are refreshed. The commercials make it seem great to relax in the summer heat with some iced tea don’t they? But even though iced tea can be refreshing, it’s important to understand some of the health risks associated with it. Iced tea, in its simplest form, is brewed tea over ice. Many big-name companies have canned or bottled this popular beverage for mass consumption. You don’t have to wait until the tea is steeped and it’s widely available in many different flavors. The Tea Association of the U.S.A. reports that 85 percent of tea consumption in America is of the iced variety. The association notes people living in the southern and northeastern states consume the most tea. Tea, whether iced or not, can definitely be considered a health beverage. This of course is also subjective to additives. Generally speaking, steeped or brewed tea can offer health benefits. Unsweetened tea provides little, to no additional calories – so don’t worry about it harming your diet. Tea can offer many antioxidants that work to fight free radical damage. And depending on the amount of caffeine, tea can keep you hydrated. Although tea can offer benefits, there have been concerns surrounding the consumption of the iced variety. In recent news, a man from Arkansas drank a gallon of iced tea every day. This led to kidney failure. It’s important to recognize the negative health effects of iced tea. Black iced tea can lead to kidney failure. Black tea contains a chemical that can lead to the formation of kidney stones or worse – kidney failure. The Arkansas man entered the hospital with symptoms of nausea, fatigue and weakness. After several tests from doctors they determined his iced tea drinking habit was to blame. Notably, the amount of tea this gentleman drank was a factor in his diagnosis. Aside from kidney stones and the potential kidney failure, sweetened iced tea can hold a lot of sugar. Depending on brand and serving size, sweetened iced tea can pack up to 24 grams of sugar. If you drink that once a day, it can add an additional 168 grams of sugar a week! But Americans aren’t drinking just one beverage a day. Studies on the drinking habits of Americans report they are drinking 10 to 11 cups – this includes water, coffee and soft drinks. So there is the potential for excessive sugar intake. Too much sugar in our diet is linked to obesity and health concerns such as diabetes and hypertension. Limiting our sweet tooth is a good way to improve our health and well-being overall. As mentioned there are health benefits in iced tea. The best way to obtain benefits from iced tea is to make your own. And if you brew a large pot, you can make enough to last for days. Making iced tea is simple: Find a tea that you enjoy. Ideally, this should be low in caffeine and organic. Follow the tea’s brewing instructions and allow it to cool down. Place some ice cubes and voila! You have iced tea. If you don’t want to dilute your tea with ice cubes, make the ice cubes out of the tea you brewed. Remember that you want to minimize sugar as much as you can, but if you do crave some sweetness, stick with a natural sweetener such as honey or agave. As the temperature rises you want to stay cool and hydrated. If you’re going to make iced tea, ensure it has low sugar content so you can enjoy all the benefits iced tea has to offer.